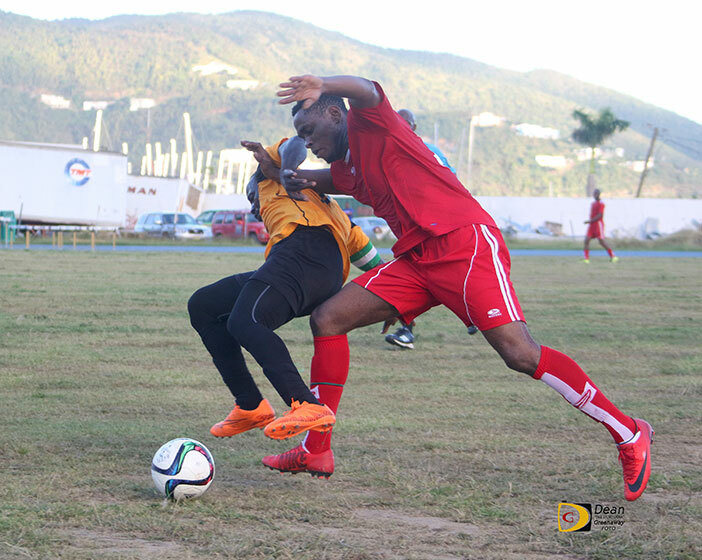 After several delays since Hurricane Irma, the BVI Football Association Men’s League kicked off on Sunday with the Virgin Gorda Sugar Boys upsetting defending champions Islanders on home soil, 2-1, while on Tortola, One Love overcame the Rebels 3-2,during Sunday’s league opening matches. The Sugar Boys used Andreas Bailey’s goal seven minutes into the match, a 1-0 lead they’d carry into halftime, on the Valley Recreation Grounds. It wasn’t until in the 69th minute that Nano Ottley, the league’s leading scorer in 2016, leveled the score at 1-1, in the defensive contest. The Sugar Boys who has the Islanders number in the Wendol “Poto” Williams Cup but can’t beat them in the Terry Evans Cup, got their first regular season win over their rivals in several years when Mohammed Kachour ended their 70-minute scoring drought with a goal in the 79th minute, to seal the 2-1 victory. The Sugar Boys beat the Islanders 1-0 for the President’s Cup, last February. In the other match, Trevor Ellis gave One Love a 1-0 lead 17 minutes in, off a ball that was misplayed by the Rebels’ goalie, in the match on Tortola at the A. O. Shirley Grounds. The Rebels who pressured One Love from the start, had more shots on goal than their rivals, but couldn’t capitalize on their opportunities, got their first score two minutes later to make it 1-1, when Chadwick Evans scored in a similar fashion to the first goal. Evans added another goal in the 42nd minute, to put the Rebels up 2-1, going into halftime. The Rebels goalie was beaten off the ball from a right corner throw in, when One Love’s Carl Stewart connected and brought the game level at 2-2, in the 69th minute. Richard Morgan scored off a deflected pass as the Rebels goalie slipped and fell, to make it 3-2 in the 80th as One Love went on to victory, while the Rebels failed to capitalize on their last two opportunities. One Love’s coach Mark Savage said the victory was important for his team. Since his team wasn’t fit, Savage said they lacked the confidence to attack the Rebels who were the first half aggressors. Despite goalie Craig St. Clair making what he called ‘silly mistakes’ Savage said a lack of training and keeping focused, are some of the things he has emphasized as being important for his team.